This newly released Hubble image shows spiral galaxy LO95 0313-192, which is locate roughly one billion light-years away. Jets, outbursts of superheated gas moving at close to the speed of light, have long been associated with the cores of giant elliptical galaxies, and galaxies in the process of merging. However, in an unexpected discovery, astronomers found LO95 0313-192 to have intense radio jets spewing out from its center! The galaxy appears to have two more regions that are also strongly emitting in the radio part of the spectrum, making it even rarer still. 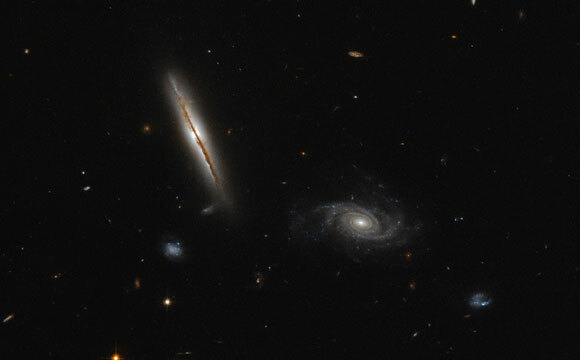 Be the first to comment on "Hubble Image of the Week – Misbehaving Spiral Galaxy LO95 0313-192"